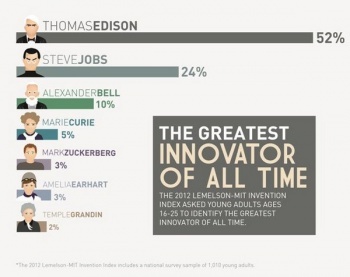 A poll suggests the Apple CEO is second only to Thomas Edison. Apple has made some great products. The personal computer is a better machine due to some of what happened on Steve Jobs' watch. But to call him an innovator is just wrong, at least to me. He invented nothing. Steve Wozniak was the technology guy behind much of what Apple did in the 80s, while Jobs was the leader and businessman. When an MIT poll asked 18-25 year olds who the greatest innovator of all time was, the majority (52 percent) blessedly chose Thomas Edison, the man who invented the light bulb and the phonograph, among many others. Still, 24 percent of you young whippersnappers needs to get a slap to the face for even putting Steve Jobs on the list. Oddly enough, the designer of the survey thinks Jobs should have won, or at least there should be some modern people other than Jobs and Facebook inventor Mark Zuckerberg on the list. "Here we have this innovation role model who has changed the way we live and yet young people still go back to Thomas Edison," said Leigh Estabrooks who led the Lemelson-MIT Program. "While he did great and wonderful things, most of his work was in the 1880s." She says this as if the passage of time makes Edison's contributions to society less important, but at least her heart is in the right place. Estabrooks is concerned with these results because she wants to foster a spirit of innovation in America's schools, something she sees as lacking. "The sooner we can share with kids the things they can do with science, technology, engineering and math, the better off we'll be," she said. "It is awfully hard to catch up with the math once you're in high school and almost impossible once you're in college. And it is hard. Therefore mentors can help by encouraging students to stick with it." That's a noble goal, but I don't think you need to tout Steve Jobs to make it a reality. He was a great CEO, don't get me wrong, a great leader, but he didn't invent anything. Jobs organized people to invent things for him, which is not exactly what you want to use as an example to young people to encourage them to be innovators themselves.